This medium sized tote bag has pink long handles and a front pocket. This bag has a pink sophisticated theme. It features a girl shaded by lace, pink flowers, a silver key and pink balloons on the back of the bag. The front of the tote bag features the quote "to hold the photo in his hands" and "sweet on the outside tough on the inside" and the quote "I'm not an acquisitions girl. I've never gotten my self-esteem from having the newest thing" and the quote "I've never been the person to hold back from something". The front also features a laced hand holding a phone, more pink flowers and a girl with a diamond earring. 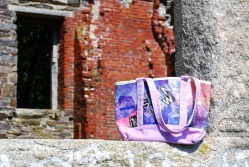 This medium size tote bag features long light purple handles and a front pocket. This is an underground music themed bag. The back of the bag features the words "Sound of Now' while the front features the phrase "pure at heart" and the quote "we started the band because we loved music but first because we were friends" and the quote "I know I've got a big mouth but I'll be the first one to tell you that we are still learning." For additional pictures click on the photo. To purchase CLICK HERE. This small sized tote bag has light yellow handles. 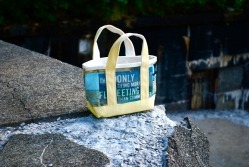 It features a summer theme and the words “The only thing more fleeting than summer”.